‘Check ignition and may God’s love be with you’ is the achingly familiar quote which prefaces Peter Terrin’s novella. It might be tempting to think that Monte Carlo was written after David Bowie’s death last year but it was originally published in Holland in 2014. Sometimes it’s a struggle to work out quite why an author has chosen a particular epigraph for their novel but in this case it couldn’t be more appropriate. Ending on the night of the first moon landing in 1969, Terrin’s novel tells the tale of a God-fearing mechanic who becomes obsessed with the actress whose life he saves. Jack Preston is the chief mechanic of Sutton’s Formula One team. It’s the job he’s worked towards since he was thirteen, losing himself in tinkering with a local farmer’s Massey Ferguson two years after the death of his father. Jack and his team are readying themselves for the start of the 1968 Grand Prix but the crowd only has eyes for DeeDee, the young, delicately beautiful movie actress who has captured everyone’s hearts including that of the Prince whose wife was once a starlet. As DeeDee walks towards him, Jack catches the scent of fuel on the air, leaping towards her just in time to save her from a conflagration. DeeDee’s bodyguard drags them both away from the flames – DeeDee unscathed but Jack badly burnt. As Jack lies in hospital, a journalist comes to interview him, his answers haltingly translated by his nurse with her sketchy grasp of English. Jack arrives home a hero, not least to his wife, but as the year passes with no word from DeeDee, no acknowledgment of his sacrifice, Jack’s obsession with her deepens until, as the villagers’ admiration leaks away, he slides into madness. From its vividly dramatic opening, this beautiful dreamlike novella had me in its grip. The first section is a cinematic intersplicing of images from the racetrack before the focus is switched to Jack and the aftermath of his dramatic rescue. Terrin’s writing is strikingly arresting: ‘Sunlight streams in through the vast windows of the reception area, reflected by the distant azure of the sea with a brilliance that verges on the audible’; ’A roar of laughter from the fat man punches a hole in the dignified serenity of the grandstand’. Jack’s increasingly delusional obsession is chillingly convincing, offset by the odd flash of humour. There’s a contemporary resonance in the portrayal of celebrity although DeeDee put me in mind of Princess Diana, several decades after the events portrayed in the novel. From the fragmentary structure which suits the novel beautifully to its oblique ending, this is a meticulously crafted piece of fiction. Terrin’s written four novels besides this one but it appears that only The Guard has been translated. Let’s hope MacLehose Press have plans to publish the other three. This entry was posted in Reviews and tagged 1960s, David Doherty, Dutch fiction, Maclehose Press, Monte Carlo, Peter Terrin on 2 June 2017 by Susan Osborne. This is my first Gerbrand Bakker. I’ve been aware of a good deal of interest and acclaim around his books for a while but somehow hadn’t got around to him. With its title and glorious blue-skied cover promising summer it seemed appropriate to pick up his new novel on one of the several miserably cold, wet and windy days that began our own June in the UK. It’s set largely on a Saturday in a small Dutch village but at its centre is Queen Julianna’s visit on June 17th 1969 nearly forty years before, a day of celebration which turned into tragedy. It opens with the Queen reflecting on the many places she’s visited, the inappropriateness of a shrimp buffet at 10 a.m. and her irritation with the civil servant detailed to look after her not to mention the artist constantly sketching her in preparation for sculpting a bust. Just as she’s about to leave, ceremonial duty discharged, a young woman arrives clutching her two-year-old daughter. The Queen greets her, lightly touching the child’s cheek. Later that day an accident will leave the little girl’s family bereft. The rest of Bakker’s novel follows another sweltering June day largely through the Kaan family, beginning with Anna, the two-year-old’s mother – now a grandmother – who has regularly taken herself off to the straw loft on the rundown family farm since 1969, ignoring all attempts to talk her down. The latest trigger is her golden wedding anniversary celebration, a family trip to the zoo which proved to be far from an unalloyed joy. There are no fancy descriptive passages littered with similes and metaphors in Bakker’s writing: it’s clean and plain but richly evocative for all that. His narrative shifts smoothly from character to character, unfolding events through internal monologues filled with memories interwoven with prosaic observations on family life and the state of the farm, the most effective of which is five-year-old Dieke’s with her questions teasing out what happened to her aunt. Small details slip in through these different points of view coalescing into a picture of that other June day. There’s a great deal of quiet humour underlying the heartache – the poor old dog is thrown into the ditch by just about every member of the family to cool him down, each of them thinking that they’re the only one who’s done it, while the Queen reflects ’I am sixty years old… …For more that twenty years I have been sitting in my official capacity on lavatories like this. How long can anyone bear it?’ How long indeed! I gather from Twitter that June’s reception has not been entirely positive but as it’s my first Bakker I’ve nothing to compare it with: suffice to say it won’t be my last. Compliments to the translator, too – my bet is that it’s harder to translate plain and – apparently – simple prose while retaining its subtlety than it is to produce a flowery interpretation but David Colmer pulls it off beautifully. 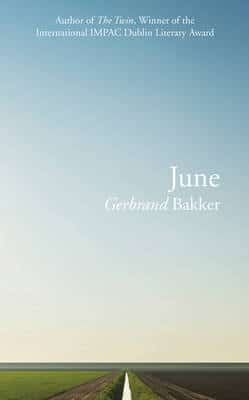 This entry was posted in Reviews and tagged David Colmer, Dutch fiction, Fiction in Translation, Gerbrand Bakker, Harvill Secker, June on 19 June 2015 by Susan Osborne.